Winter care for your horse usually involves extra concern about watering, feeding, and blanketing when temperatures fall below normal. Horses do become acclimatized to normal regional weather conditions… For example, horses in Southern California and Arizona don’t grow as much hair coat as horses in Montana. However, when weather conditions differ greatly from what is normal, it places stress on our horse’s digestive system and on us. 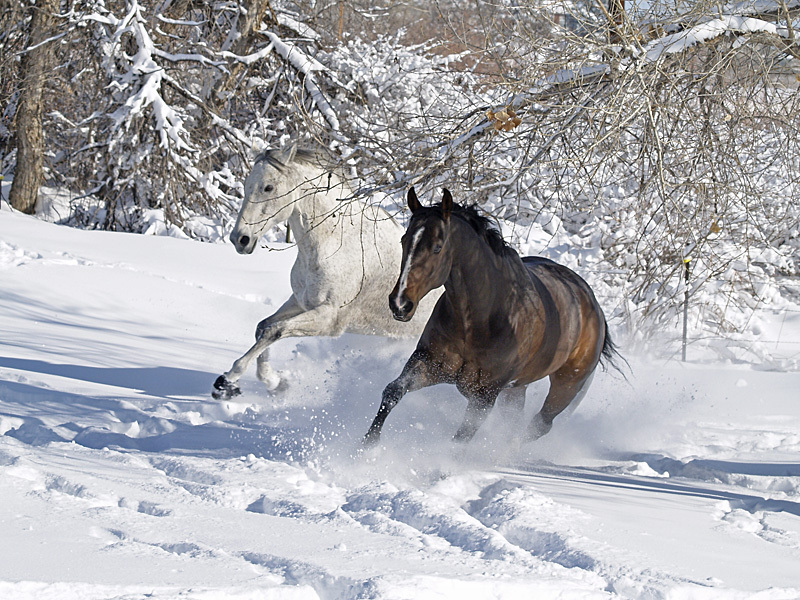 It’s especially difficult for horses that haven’t acclimatized or haven’t had to cope with freezing weather before. They don’t know how to break ice, they don’t like to drink water that’s so cold, they’re suspicious of floating water de-icers, or heated water buckets, they don’t like water that’s too warm. This is not the time to make big changes to your horse, if you can help it—not in feed, environment, or activity. COLIC and Winter Weather: Coping with unusual conditions is stressful for most horses, and when stress is compounded by feed and water consumption changes, colic becomes the number one concern. Be aware of your horse’s manure—both quantity (the daily number of piles should not decrease by much) and quality (you don’t want dry, hard balls). Since it can take 2-3 days for food to move through a horse’s digestive tract, the elements that can create a colic situation, may not show for a few days. If you think your horse may not be drinking enough, check for dehydration by using the pinch test on the neck to check for elasticity in the skin, Click here to learn about the pinch test. You can also check the moisture on your horse’s gums. The gums should be very moist (like yours) if they are in the least bit dry, you need to call your vet, even if your horse does not show symptoms of colic yet. If you are not sure what the symptoms of colic are click here for more information about signs of colic. WATER: Water is one of the most important, if not the most important thing to consider. The chances of impaction colic are greatly reduced if your horse has clean, fresh water to drink at all times. In my experience, it is best to get your horse used to whatever method you are going to use before it gets so cold that your water freezes over. If you have access to power, install a stock tank heater or a heated bucket before freezing weather arrives. Your horse will have time to become accustomed to the new object, the warmer water, or the different location while the weather is still mild. You might also need to figure out how to haul water to your horses. A water-carrying tip: line your bucket with a clean garbage bag, fill the bag with water, and then tie the bag with a twisty. This enables you to transport water without spilling much. If your horse is still reluctant to drink, one method I’ve used with great success is to submerge some tasty hay into a water bucket, and as they begin to munch they will slurp the water and find it’s not so bad after all. If your horse still doesn’t seem to be drinking enough, try soaking your hay. Place it in a hay in a large tub and soak about 15 minutes. Let it drain a bit and feed. (Yes, they’ll eat it even if it’s frozen). Soaked hay does not replace drinking water, however. FOOD: One of the best ways to keep your horse warm, is to keep his digestive tract full and working. The gut takes up a great space in the barrel, and the fermentation process of digestion really does keep your horse warmer from the inside out. Providing a hay that can be munched on 24/7 is great. If that doesn’t work for you, try to offer as many small meals to horse as you can. A lower calorie hay is great to have on hand for feeding during freezing weather. Feeding a high fiber diet (usually in the form of hay) works best for keeping your horse warm. HOW YEA-SACC CAN HELP: Yea-Sacc will help your horse’s digestion by stabilizing the gut pH, keeping the digestive “good bugs” happy and working properly, helping break down the fiber, and helping to maintain the flow of digested feed, thereby reducing the risk of colic. TO BLANKET or NOT TO BLANKET: Some people blanket their horses regularly and others, like me, blanket particular horses in extreme weather because the horse is elderly, or very young, doesn’t grow much hair coat, is thin skinned and is shivering, or is debilitated in some way so that they don’t or can’t acclimatize to the colder weather. A blanket can keep them more comfortable, assuming that it is the right size, the right type for the weather conditions, and that it is in good repair (water-proofed, breathable, no rips or tears) If you do blanket all the time, or just at particular times please make sure you check under the blanket at least once a day, or better yet morning and evening. Check each point at which the blanket makes contact with the body, the withers, point of shoulder, hips, and loin. If the underside of the blanket gets damp either from rain, sweat, or condensation remove the blanket. If the blanket gets wet (or even damp) on the underside, the horse is better off without the blanket. A wet or damp blanket will chill the horse, and the weight on the pressure points can be extreme. A wet or damp blanket will also create an environment for skin conditions that you really want to avoid. So, if your horse is healthy, grows a good coat, and you have shelter available, the best thing might be to not blanket at all. EXERCISE and SHELTER: Exercise is important at all times, as is shelter from the elements. If your horse is healthy, he shouldn’t be confined in a stall all the time just because it’s cold out. Horses need to move for both their mental and physical health. As we have been enduring out door temperatures below 20 degree weather for several consecutive days, I have come to admire all you horsemen (and women) who deal with subfreezing weather most of the winter. This entry was posted in Bio-Mos, Digestive Health, Yea-Sacc. Bookmark the permalink.